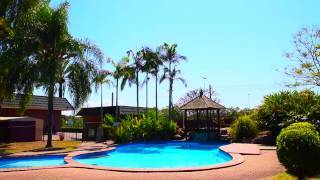 The Ipswich Country Motel offers all you need in a motel with country-style friendly service. Located just a few minutes drive from the Ipswich Central Business District and walking distance to Brothers Leagues Club with a small shopping village conveniently located just across the road. Overlooking sporting grounds and bushland makes it's the perfect quiet spot to wind down between exploring Ipswich's many points of interest. Offering 45 comfortable, well appointed rooms, some fully self-contained plus free fast and reliable Wi-Fi for all guests. Parking is at your door, mostly undercover and also caters for Recreational Vehicles and Caravans with a few secure sites for short stays. A very spacious car-park can easily accommodate trucks and buses. The motel has a picturesque pool complete with Bali hut that is popular for weddings. Catering for functions/conferences/weddings both big and small, having up to a 250-person capacity. Unwind in the evening with a perfectly chilled drink and delicious meal from on site restaurant, Mediumrare Char Grill and Bar, boasting the best steaks in Ipswich. Close to both the Cunningham Highway and Brisbane Road, it's an ideal location for travellers and is a leisurely 30 minute drive from Brisbane Central Business District. Spacious room with a Queen Bed and a Single Bed. Rooms include Tea and Coffee making facilities, toaster, iron and ironing board, reverse cycle air-conditioning, mini bar, desk and selected Foxtel channels. Large bathroom with complimentary amenities. Undercover parking is at your door (ground floor rooms). Of course free and fast Wi-Fi is included! Comfortable, spacious and modern rooms include one Queen bed and either one Single bed or Single Sofa bed. Also tea/coffee making facilities, toaster, microwave, crockery and cutlery, iron and ironing board, reverse cycle air-conditioning, fridge, mini bar, dining table and chairs, 40 inch high definition television and selected Foxtel channels. Quiet and relaxing location, the rooms over look bush land and sporting fields. Parking is at your door in an oversized reserved parking bay. Of course free, fast and reliable Wi-Fi is included! Some rooms available that interconnect with adjoining self contained International Studio Apartment. Spacious two bedroom family suite contains one queen bed in a separate room and three single beds in the other room. Bathroom has a separate bath and shower and large vanity with complimentary amenities; reverse cycle air-conditioning, tea/coffee making facilities, toaster, refrigerator, ironing facilities, mini bar, flat screen television in each room with selected Foxtel channels. Undercover parking is right at your door (ground floor rooms). Free, fast, reliable Wi-Fi is included. A very spacious two room suite featuring a full size self contained kitchen with dining and lounge area. A queen bed is located in a separate room and the living area has a single bed and a double sofa bed. Both rooms have reverse cycle air-conditioning and high definition television with selected Foxtel channels. You will feel very spoilt in the oversized bathroom which features a deep soak corner bathtub, separate shower, loads of vanity bench space and complimentary amenities. Under cover parking at your door. High speed Wi-Fi is free! Ideal for corporate travellers and couples. The room is spacious with a queen bed, two seater sofa, 40 inch high definition television, selected Foxtel channels, reverse cycle air-conditioning, mini bar, tea/coffee making facilities, toaster, microwave, crockery/cutlery, desk, iron and ironing board. The bathroom is large and has great vanity space, hairdryer and complimentary amenities. Convenient undercover parking at your door. Free Wi-Fi is included which is reliable and fast! This spacious one bedroom apartment features a full size self contained kitchen, allowing you to prepare your own meals. Comfortable queen size bed plus a single fold out sofa. Facilities include reverse cycle air-conditioning, 40 inch high definition television and selected Foxtel channels. Large walk-in shower, plenty of vanity space, hairdryer and complimentary amenities. Quiet location with country views, tranquil and relaxing. Convenient extra large parking bay right at your door. Of course free, fast and reliable Wi-Fi is included! Newly refurbished and generous in room size featuring a Queen Bed and a Single Bed. Tea and Coffee making facilities, toaster, reverse cycle air-conditioning, iron and ironing board, mini bar, selected Foxtel channels plus free unlimited wi-fi. Spacious bathroom with complimentary toiletries. Some rooms are available with bath and separate shower/microwave,crockery and cutlery on direct request only). Free undercover parking at your door (ground floor rooms only). Newly refurbished spacious room with one queen bed, 40 inch high definition television, two seater lounge with coffee and side tables, reverse cycle air-conditioning, desk, tea/coffee making facilities, toaster and microwave, crockery and cutlery and mini bar. Undercover parking at your door. Selected Foxtel channels plus free fast and reliable wi-fi. International Room is very spacious and has one queen bed plus either one single bed or one sofa bed, reverse cycle air-conditioning, 40 inch high definition television with selected Foxtel channels, microwave, crockery/cutlery, dining table and chairs, tea/coffee making facilities, mini bar, iron and ironing board. Spacious parking at your door. Some rooms are available which interconnect to International Studio. Free Wi-Fi is reliable, fast and unlimited. Newly refurbished two bedroom family room is spacious and includes a queen size bed in a separate room and three single beds in main room. Both rooms have their own high definition television with selected Foxtel channels and connect into the same bathroom with bath and separate shower. They have reverse cycle air-conditioning, tea, coffee and toast facilities. They also have a microwave, cutlery and crockery. Undercover parking is available at your door (ground floor rooms only). There is also free fast and reliable wi-fi. Newly refurbished spacious two room Executive Spa Suite features a full size self contained kitchen, double sofa lounge, single bed, 40 inch high definition television, dining setting and reverse cycle air-conditioning in the living area. The master bedroom has another high definition television and reverse cycle air-conditioning, queen size bed and desk. The oversized bathroom features a corner spa bath, ideal for relaxing at the end of your day, it also has a large separate shower and heaps of vanity space. They also have selected Foxtel channels, mini bar, convenient undercover parking at your door and free, fast and reliable wi-fi. This spacious one room apartment features a full size self contained kitchen, allowing you to prepare your own meals. Large walk-in shower. Ideal for the corporate guest. Comfortable queen size bed and a single fold out sofa, 40 inch high definition television with selected Foxtel channels, reverse cycle air-conditioning, mini bar, dining table and chairs, spacious parking at your door. Quiet location with country views. Free, reliable and fast wi-fi. Family Double Suite is Newly refurbished. It includes a Queen size bed and single bed in one room and three single beds in the second room. Both rooms have own a high definition television with selected Foxtel channels and connect into same bathroom, Reverse cycle air-conditioning is in each room. They also have tea, coffee and toast facilities, microwave, crockery and cutlery, dining table and chairs. This is a very large suite. Enjoy free fast and reliable wi-fi and undercover parking at your door. Offering that extra bit of space for families, groups or workers on a budget. Two separate bedrooms each with a queen bed. The third bedroom has two single beds, 40 inch high definition television and lounge which is open to the adjacent dining area. Facilities include tea, coffee and toast making facilities, microwave, fridge, mini bar, air-conditioning and selected Foxtel channels. Important Information: the bathroom is small and can only be accessed by walking through the two queen bedrooms, limiting privacy. An extra external bathroom is also available for guest use. This room is an older style budget accommodation.